While not so surprising (insecticides kill bees, an insect) it’s great that the American Chemical Society has stepped up and done a real world case study to conclusively prove that neonicotinoids kill bumble bees. Oxalic Acid for Varroa mite control…Not so much. Varroa Destructor, as an introduced pest, has dramatically disrupted the life of Apis Mellifera, but the path to resolution of the problem lies with genetics, not chemicals. Attempting chemical control of Varroa Destructor is a lost cause and is actually creating stronger mites, and weaker bees. Some extension agents were known, in the not so distant past, to pressure keepers into treating to ‘prevent the spread of mites’. It seems more realistic in light of new research and the reality of feral survivor colonies that we should now pressure keepers NOT to treat, to prevent the spread of weak genetics that can only survive with human assistance through chemical treatment. The list of treatments no longer effective continues to grow (http://www.biosecurity.govt.nz/pests-diseases/animals/varroa/paper/varroa-treatment-options.htm, search for ‘resistance’ within the article). As of this publication Treatments containing Thymol and Oxalic Acid, for now, seem to be an exception. Contrary to tonights presentation, the article above even suggests that genetic resistance for Oxalic Acid is unlikely…time will tell. 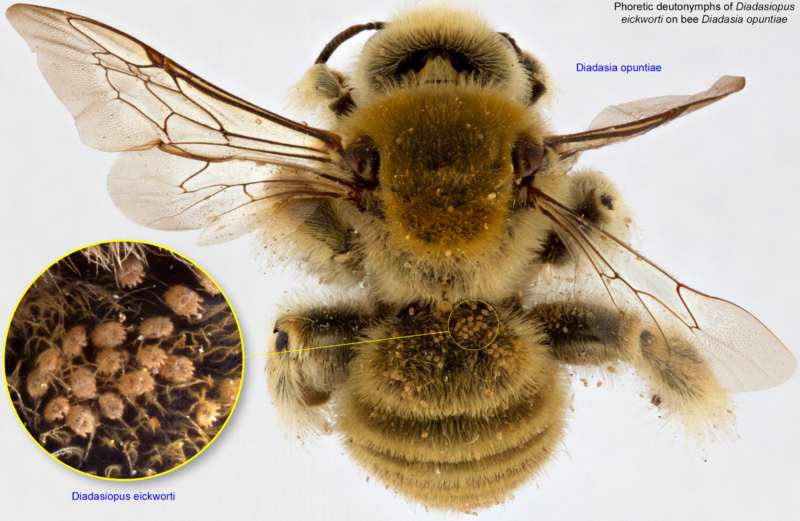 The most rational ‘treatment’ for mite control we have at present is to assist natural selection by pushing the European Honey Bee toward more rapid evolution until they achieve Mite resistance and can live ‘in harmony’ with mites like their Asian cousins Apis Cerana, where the Bees and Varroa Destructor co-evolved in the first place (http://www.sciencedirect.com/science/article/pii/S0022201109001906, https://en.wikipedia.org/wiki/Varroa_destructor). This eliminates a queen with weak genetics, disrupts the brood cycle long enough to dramatically reduce mite populations, and results in a queen with locally tuned genetics for your region–hopefully with some hygienic or new, yet undiscovered mite resistant traits. You only kill the weak mites, leaving the strong ones to breed a new, stronger crop of mites potentially even more genetically resistant to chemical treatment. With their shorter life cycle (just 10 days from egg to adult) natural selection works at a rate more than 36 times faster than a bee colony whose queen is replaced annually (this is an over simplification, but you get the idea…The potential for genetic variation occurs with every new sexual reproduction event, but it’s more complex as Honey Bees mate with more than one drone, and my math above doesn’t account for winter in temperate regions). Not only is this much more complicated because queens store sperm from many drones, confusing me on the difference between inter generational genetic variation (which will occurr every 10 days with mites, but only when the queen is replaced in a colony), and inter-sibling genetic variation (which must be less significant)…But I’m only lightly poking at (and becoming aware of) the significant complexities of natural selection forces on two entirely different types of reproductive strategies, that between the eusocial Honey Bee and the subsocial Varroa Destructor mite…(https://www.ncbi.nlm.nih.gov/pmc/articles/PMC1224642/ and Honey Bee Biology and Beekeeping, Carson, Chapter 3: Sociality). Any geneticists bothered to read this far? Help me out, send a note to clear all this up for me. *The acid is ineffective at treating mites in the reproductive phase of their life cycle, inside capped brood cells. *The acid is 70 times more toxic to mites than bees…meaning it is toxic to bees just 70x less. *Treatment of packages (where all mites are in the phoretic stage and the Oxalic Acid would be most effective) isn’t recommend as bees treated in this way, tend to immediately abscond when hived. *Treatment by Oxalic Acid should only be performed once a year to reduce the chance of creating resistant mites. *Never treat a colony with honey supers on (I guess top bar keepers should mark their combs in the hive when treatment occurs). *The acid in its concentrated form is a poison, and a corrosive agent. *Handling requires protective googles, gloves, and clothing, as well as a readiness for immediate first aid measures. *It is relatively cheap. You can buy enough for several treatments… for about the same cost as a Minnesota hygienic queen. *While he cautioned that stored diluted solutions should be well labeled, he showed bottles stored in a household refrigerator alongside food. In my opinion, hazardous chemicals, especially corrosive poisons, should never be stored alongside food under any circumstances. *If stored incorrectly, the dilute solution will contain break down products more toxic to bees. And at this point, I decided to leave the presentation before it was finished. Why would I put money into a dangerous chemical product, with special handling, storage, and disposal requirements, which may result in stronger mites while not hurting the bees ‘all that much’. Given that Varroa sensitive traits are genetically recessive (http://www.beeccdcap.uga.edu/documents/spivak466.pdf this is a great article) we’re going to have to have vast participation in no-treatment activity to enhance natural selection. The one thing that gives me solace is that eusocial insects are some of the most successful on the planet, and genus Apis have managed to survive for 25 million years (http://bibba.com/honeybee-origins/). Maybe all we really need to do is get out of their way and stop poisoning them with chemicals so they can evolve to withstand the parasites we have introduced to them through global trade. Either way, I expect they will out live Homo sapiens on this planet, as they are not actively engaged in poisoning their own well. But who needs the EPA, Really! Bees Bees Bees, So Many Genera! We took a little break from the cold and came down to the Yucatan for the holidays. Of course the first thing I did when we made it to home base in Merida was to hunt down a beekeeper. According to the one shop owner/beekeeper (apicultor) we spoke with, for genus mellifera bee keepers, their busy season runs from January to May. He has around 200 Langstroth hives and sells a thin, sweet, aromatic, fruity honey in plastic 1 Liter bottles (1400grams) for 150 pesos or around $7.50. If his labels are any indication, they have more stringent labeling requirements here than we do in NC as he has full nutrition information, net weight (in grams and ounces), full contact information including business name, phone, address, and email. I wish I had a refractometer with me to test this honey…It’s hot as blazes here (95F yesterday! ), but still, it doesn’t seem like this honey is anywhere close 18.6% water, as it flows like water…A very different honey from raw WNC honey. What’s really exciting though is that they have several other genus of honey producing bees here that I have spoken with folks about. These are little, stingless bees with small colony size that naturally live in hollow trees, and are kept in hives of hollow logs or clay pots. The genus Melipona bees have a horizontal brood nest (like a stack of pancakes on a stick) sometimes surrounded by sheets of wax forming a kind of ball around the combs. They make little wax pots outside (around or beside the brood nest) with openings at the top to store nectar in! They are just crazy amazing. 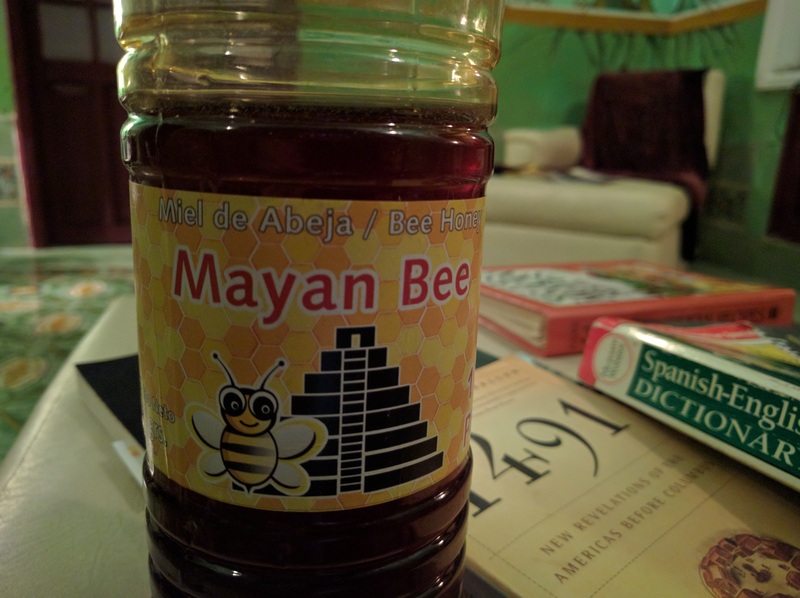 I’m trying to schedule a visit to “bee planet” (abeja planet) just South of Merida. They’ve shipped all their Melipona bees to Valladolid for the ‘winter’ but still have some Trigona bees at the site. So close to Christmas though, in this Catholic country, it’s not easy getting together with people in the mad holiday rush of pre-Christmas festivals and shopping. 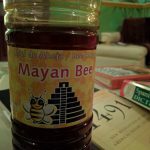 If anyone has contacts or knows of bee sanctuaries/demonstration apiaries/bee keepers here in the Yucatan near Merida, please let me know, as I’m not sure I’m actually going to be able to pull off a visit with the folks at bee planet (they’re officially on vacation until after we head back to the US). I’m pretty amazed by these tiny, stingless, honey collecting bees!